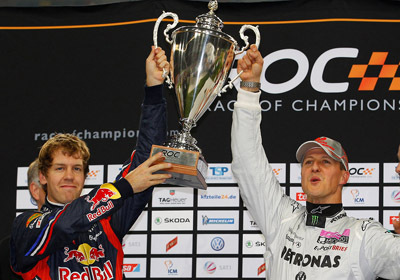 The plot thickens for the 2012 Race of Champions, which is held from 14 to 16 December in Bangkok, Thailand. After usual suspects Michael Schumacher and Sebastian Vettel signed up to defend their title for Team Germany, an impressive array of fellow stars followed suit. After triple V8 Supercar champion Jamie Whincup and IndyCar champ Ryan Hunter-Reay confirmed their presence, recently crowned MotoGP king Jorge Lorenzo is the next 2012 victor to join the season ending party in Thailand’s national Rajamangala Stadium. The event combines hard head-to-head racing in identical exotic machinery with a great ambiance and camaraderie between the drivers. This year ROC is celebrating its 25th anniversary since it was first held in 1988 as a competition between rally drivers and a tribute to the late Henri Toivonen. Last year’s edition in Düsseldorf, Germany, was won by French rally ace Sébastien Ogier, who beat Le Mans legend Tom Kristensen in the final. The car park included an Audi R8 LMS, VW Scirocco, KTM X-Bow, a stock car and a variety of buggies.